I had the pleasure of meeting Mara Rockliff at the SCBWI National Conference last year. We both attended a lovely evening social for nonfiction authors. I was delighted when Mara told me about her new book – Chik Chak Shabbat (Candlewick Press), a heartwarming picture book about Shabbat, cholent, and the true meaning of friendship. The illustrations depict a cozy urban neighborhood as friends create a multicultural Shabbat feast. 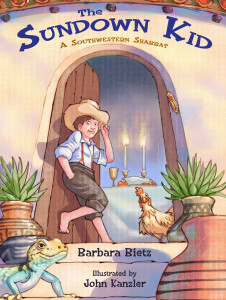 Chik Chak Shabbat will be enjoyed by young readers, little listeners, parents and grandparents! 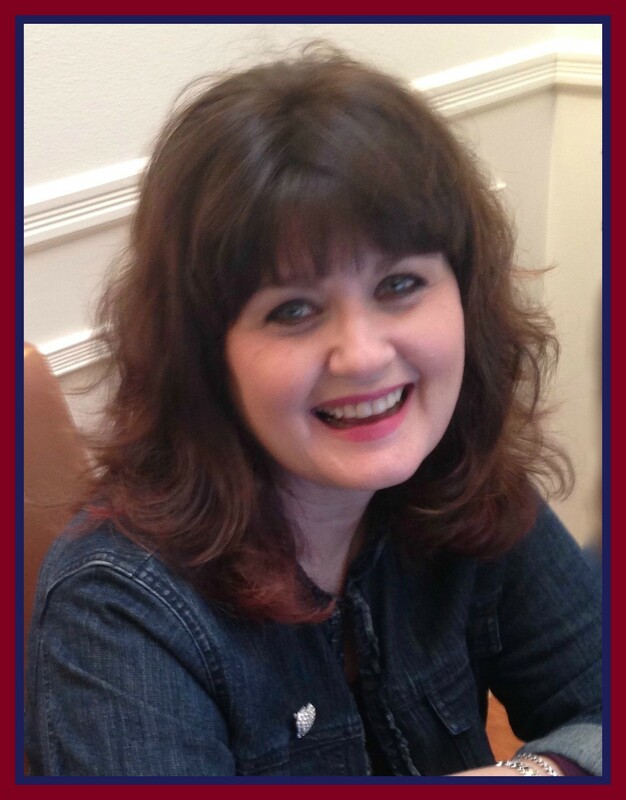 I am so pleased to welcome Mara to my blog and to learn more about her new book. 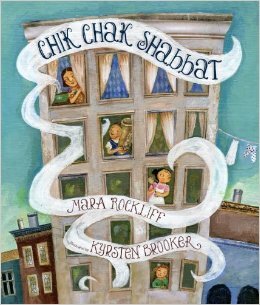 Chik Chak Shabbat is about a neighborhood coming together to help a friend celebrate on Shabbat. What was the inspiration for this story? Well, just like Goldie in the story when she makes her grandma’s cholent (stew), I threw in a bit of everything I had on hand. One inspiration was my neighbors, who host a potluck dinner every Friday night to share Shabbat with the community. Jewish and non-Jewish friends gather to light the candles, say the blessing, and celebrate the end of the week together. To that, I added the Hebrew phrase “chik chak.” It means about the same as Mary Poppins when she says “spit spot,” and it’s fun to say. I remembered hearing people say “chik chak” when I visited Israel as a teenager–in fact, there was a fast food chain called Chik Chak Chicken. I also remembered more religious friends whose families ate cholent on Shabbat. Cholent, of course, is the opposite of fast food. You start it cooking before Shabbat begins, and then you leave it over a very low flame to cook all night and day. It’s a way to have a hot meal on Saturday without doing anything Jewish law says not to do on Shabbat, like cooking or lighting a fire. But it’s also a dish that exemplifies Shabbat, which is a time to slow down, be with family and friends, and appreciate all we have. How did you feel when you first saw Kyrsten Brooker’s illustrations? Kyrsten has a wonderful style–a little funkiness, a little humor, and a lot of warmth. I think she was a perfect choice! Before the book came out, I had a chance to share it with art teachers at a picture book institute, and they loved the way Kyrsten combines paint with collage. The final scene, where characters dig into “real” photos of food, should inspire some really fun classroom art projects. Although Chik Chak Shabbat is fiction, did you do research to help you add details to the story? I write a lot of historical picture books, so usually I do tons of research. 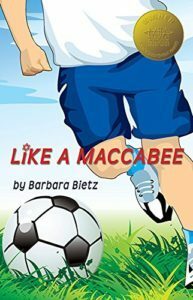 With Chik Chak Shabbat I almost got away scot-free…until my editor asked for a cholent recipe to put at the end of the book! Cholent as I remember it always had flanken (beef short ribs), but in the spirit of the story, I wanted a recipe anybody could enjoy. So I searched for all the vegetarian recipes I could find, and then I mixed and matched them to create an easy cholent recipe using very common healthy ingredients. And to complete my research, I tested the recipe on my family. In the book you depict a colorful multicultural, multi-generational community. Were you inspired by a particular city? I lived in New York City in my twenties, so for me “the city” will always be New York. I know my editor and I both pictured Goldie Simcha, the main character, as kind of a young Brooklyn hipster. I think you may have started a new tradition for Shabbat dinner! Have you ever celebrated Shabbat with potato curry, Korean barley tea, tomato pizza and beans and rice? I’m not sure I’ve had that specific lineup, but potlucks definitely lead to lots of interesting combinations! I’ve had many meals where I filled my plate with specialties from all around the world. Thanks, Mara! What a delicious time I’ve had with you and Chik Chak Shabbat. This entry was posted in Chik Chak Shabbat, Mara Rockcliff by admin. Bookmark the permalink. 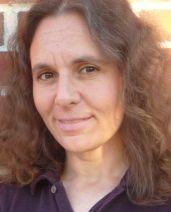 ← Previous Previous post: Welcome Barbara Krasner!